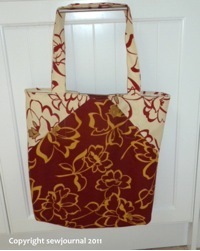 Finally my new bag pattern is finished. If you’d like to make one or two of these funky “green” shopping or project bags then click on the Paypal button over on the right. I’ve made the pattern easily affordable in the hope that people won’t print out lots of copies for their friends. If you want to share then just change the quantity in the Paypal form and when I email you the pattern I’ll give you permission to send copies to the number you’ve purchased. This may be naive of me but I think most people are honest and understand that at $5 a pop I’m not making a fortune. I finally got around to making these bags. I used vinyl covered cotton. My sis just loves hers, and has to guard it from my niece! That’s great Sue. Where can we see pics?